The National Road Association of Illinois named the Brooks® World's Largest Catsup Bottle® as an Art and Architecture Landmark. There are 9 other Collinsville sites also recognized. The 100 or so locations all across the state will be promoted by the Art and Architecture Tour with signs, brochures, and information on the organization's website. Get the complete story here. The comedy-magic duo of Penn and Teller have announced their new show coming to the Discovery Channel in the fall. The program will be called Penn and Teller: Secrets of the Universe. We here at Catsup Bottle Command HQ have been working with a producer of the show for a segment that will have, of course, something to do with ketchup. That's all that can be said for now... stay tuned! The World's Largest Catsup Bottle Festival Birthday Party & Car Show Bash is featured in a new book titled Amazing Festivals - 100s of Hometown Celebrations by Publications International. The 320-page hardcover book showcases some of North America's longest running, most popular, and quirkiest festivals. The Catsup Bottle Fest is right up there with Bonnaroo, Coachella, the Great Wisconsin Cheese Fest and Frozen Dead Guy Days in Nederland, Colorado. 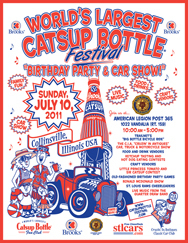 Despite the heat and humidity, the 13th annual World's Largest Catsup Bottle Festival, held on July 10, was a success! For more info, winners results, and a complete photo gallery, click over to the official Catsup Bottle Festival website. We'll see you again next year on Sunday, July 8, 2012! As a commemoration of its 40th anniversay, Landmarks Illinois announced its list of the Top 40 Preservation Success Stories that occurred in Illinois over the past 40 years. The World's Largest Catsup Bottle was on the list along with other great projects like Frank Lloyd Wright's Dans-Thomas House in Springfield, the Chicago Public Library, and the U.S. Post Office and Courthouse in Quincy. "All the news that's fit to print." 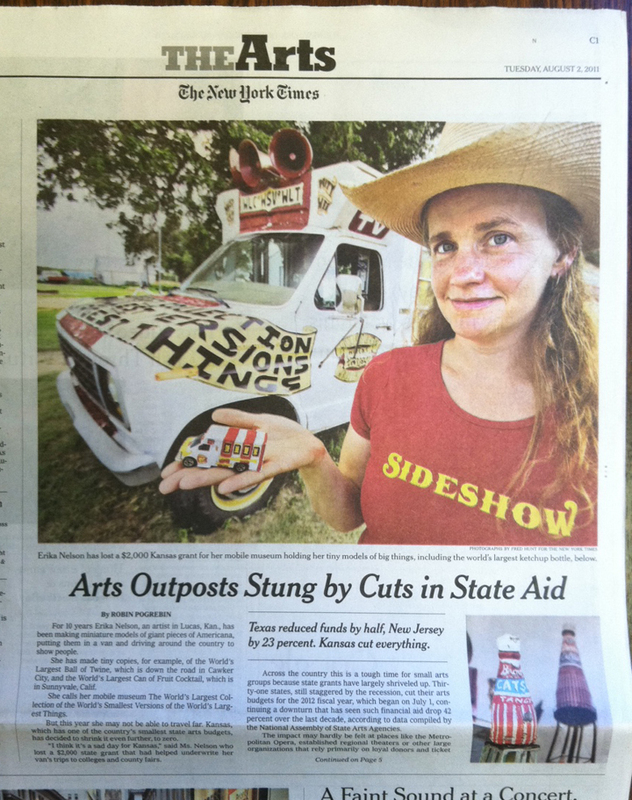 The New York Times ran a piece on page 1 of The Arts section about some states cutting funding to the arts from their budgets. The article features our Catsup Bottle buddy, Erika Nelson of Lucas, Kansas, known for her World's Largest Collection of the World's Smallest Versions of the World's Largest Things and other artistic ventures. Aside from the huge photo of Erika, their is also a photo of a photo of the World's Largest Catsup Bottle with its mini-me version! Click here to get a closer look of the newspaper, and click here to go to The New York Times page. The Big Apple calls the Big Tomato! Less than a week after a photo of the Catsup Bottle appeared in The New York Times, a writer with the NYT Dining & Wine section called to talk about ketchup. Julia Moskin's article was about having respect for unique, interesting and specialized ketchups. She included a mention of Brooks rich & tangy ketchup and a quote from The Big Tomato. Click here to go to The New York Times. 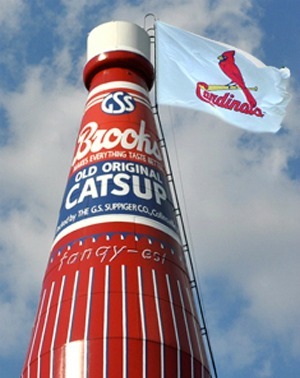 As the St. Louis Cardinals completed their historic regular season comeback and cruised into the MLB playoffs, we really got into the spirit around here and hoisted a giant Cardinals flag to the top of the Catsup Bottle! Well, no actually it was just a little Photoshop trickery. But, it brought a lot of smiles to a lot of people on our Facebook page. It even caught the attention of Mary Delach Leonard of the St. Louis Beacon who considered it "a vertual hoot!" As the Cardinals came home to roost for Game 3 of the NLDS against Philly, we were pretty thrilled to be included in Mary's article here from the Beacon. The new Catsup Bottle Christmas ornament has arrived!!! We're really excited about this and we're sure you will be, too! The quality of these ornaments is beyond compare. Simply put, they are beautiful. And, we're very proud to say they're 100% made in the U.S.A.! Plus, if you are in the Collinsville, Illinois, area, these ornaments are available for purchase at Ashmann's Pharmacy, Dean's Liquor, The Flower Basket & Cullop Jennings Florist downtown, as well as both Collinsville Walgreens locations. Stop in and pick yours up today! Columnist Wally Spiers writes a piece about the Catsup Bottle ornament in the Belleville News-Democrat. (right here) Wally's great story sends our sales through the roof! We literally had trouble keeping up! As soon as we would make a delivery somewhere, by the time we returned to Catsup Bottle Headquarters, we had recieved a call requesting more. Many thanks to Wally Spiers, our retailers, and everyone who purchased an ornament or two, for making this venture a sell-out success!